In early 2005 I was scrambling to finish up Dungeon Siege II, in a mad dash to gold master, and I was approached by the producer for Supreme Commander (abbreviated SupCom). I was asked to come up with a hundred or so sound effects for aN E3 demo and to a create a full on audio track for a cinematic trailer. I was so busy working 16 hours days on Dungeon Siege II that I wondered how the hell I was going to get these sound effects and a trailer done. I had some time before SupCom was ready for these sounds. The cinematics team was working overtime to make the trailer so my only concern was for the Dungeon Siege II deadline. I finally ended up spending a week on the SupCom sounds and fit the trailer into the schedule here and there as the video was finalized. The week I spent designing sound effects for SupCom is a blur now, but one thing that came out of it was that I had the basis for what would become the “vibe” for each of the three warring factions the United Earth Federation, the Cybran, and the Aeon. Because of time constraints, I had to work quickly. I had no time to experiment and did not want to use stock CD library sounds on their own. This demo was a big deal and sound was going to play a big role in presenting SupCom to the world. There was to be private demos for a select few and these select few were the ones who needed to hear SupCom in all its glory even with all the E3 Expo noise on the show floor. I had my work cut out for me and so it began. 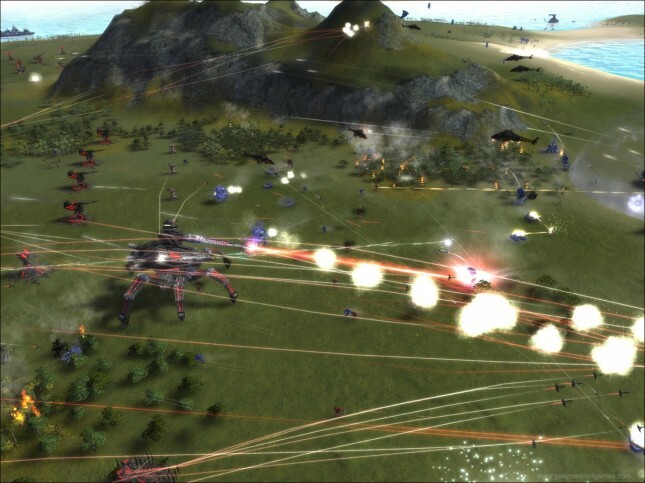 Here is a little background on Supreme Commander which was released in early 2007. 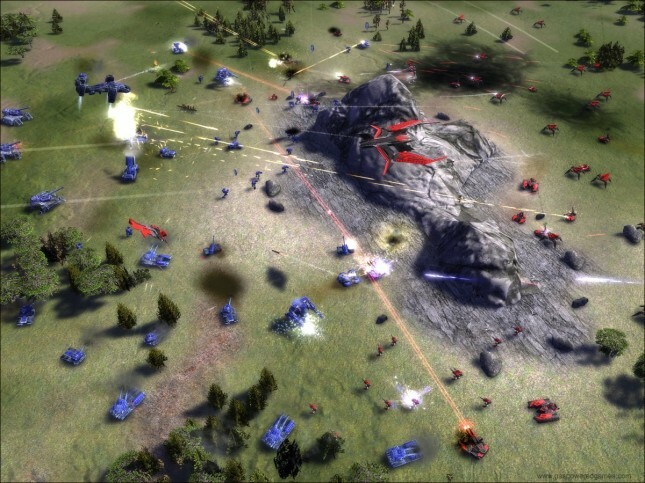 Supreme Commander is a real-time strategy computer game set in the future and designed by Chris Taylor and developed by Gas Powered Games (GPG). The game is considered to be the spiritual successor to Taylor’s 1997 game, Total Annihilation for which I designed all the sound effects. SupCom is focused on using a giant bipedal mech called an Armored Command Unit (or ACU) to build a base, then upgrading units to reach higher technology tiers, and conquering opponents. The player can command one of three nations: the Aeon Illuminate, the Cybran Nation, or the United Earth Federation. These ACUs are designed to be transported through quantum gateways across the galaxy and contain everything necessary to create a 37th century army from a planet’s native resources. All regular units except Commanders and summoned Support Commanders are self-sufficient robots. All units and structures belong to one of four technology tiers, or “Tech” levels, each tier being stronger and more efficient than the previous. I did not have very much time to create all new sound effects for the E3 demo so I decided to start with the UEF. Since they are more or less a futuristic version of our modern day weapons, all I had to do was find some source that was conventional and add some elements to make them appear futuristic. Once I had this base set of material all I had to do was figure out a way to expand on the UEF style for the other two factions. I thought the best approach was to use certain audio processing plug-ins only for a specific faction. This would speed up the process a little and make the factions sound different from each other. My idea was to use only the Eventide Anthology set for the Cybran and the Waves Transform bundle for the Aeon. I did use different source sounds for each faction so they were already different from each other, but I wanted to add some special quality that only these plug-ins can produce. It worked out well In the end. Each faction had its own distinct sound because the audio processors I used added their own unique sound to the final in-game asset. I was hired on full time at GPG as Audio Director shortly before I started official production on SupCom. This meant I had to take charge of the whole sound production process from picking a new sound engine, sound effects design, implementation, and in game dialog production, to creating and mixing all the in-game cinematics. I had never taken on a game project from beginning to end. Most of the projects I had worked on I was just the lead sound designer or one of many sound dudes. This time GPG wanted me to handle all of it. No problem I thought, I can do this… Okay, I was freaking out. I could write ten articles on every thing I did for SupCom, and it would be fun and challenging to remember all the monumental tasks. For this article though, I’ll stick to the sound effects design and a few other areas that impacted the overall sound of the game. I will showcase some of my favorite units and their sound as a composite representing how it played back in game. I have included a video showing some cinematic clips and gameplay footage that actually has the game engine sound included. SupCom ended up using the XACT audio engine from Microsoft, and all the audio was run though this engine including the Cinematics audio track. Basic Model: How Is This All Going to Work? SupCom is so massive and has so many units that the game engine was generating over 4000 sound cues and shoving them into XACT. I set up XACT to ignore all but 10 percent and employed extreme voice limiting via the sound cues themselves and the groups to which they were assigned. At any given time, the screen was showing hundreds of units on a Multiplayer map but only about 200 sounds could be heard…all at the same time! This still made for a gigantic mess of sound so the refinement had to come from the sound effects themselves and the volume level at which they played at a particular screen zoom level. There were many groups of sounds including: moving units, structures, unit weapons, explosions, impacts, map ambience, map emitters, dialog, and others like the UI, music, and cinematics. Each moving unit consisted of four to six sounds including a start into move loop, stop, weapon fire, death explosions, and ground impacts. The air units had extra sounds adding a turn thruster, hover, and a landing power-down. Any unit that walked had a different sound set that included a separate start and footstep impacts on the ground. The naval units had the standard compliment of sounds plus a looping turret sound for rotation and barrel raising. Special case units that moved into water, over water, or underwater used alternate loops appropriate for water. Every unit had a “build complete” sound that was global to the type of category the unit was and a UI select sound that was also category based. Structures and factories had a looping operating ambient loop as well as some special case radar and sonar units that just sent out a single “ping” sound. The factories had some others sounds like a start-up into a loop for the constructing of a unit and a stop when the unit was done building. There were even some that had doors opening and closing or a set of hatches. Structure based weapon units had a weapon fire sound, hatch open/close, and a turret rotate and elevate sound if they had a turret. Each map had its own set of sounds including an ambient loop for the general feel of the map and then various emitter sounds that played for objects on the screen. SupCom had lots of explosions. I originally wanted each unit to have its own death explosion but memory restrictions came into play and a unit category system was used. Within each faction the small, medium, and large units had their own set as well as special explosion sounds for nukes and big energy weapons. I designed projectile impacts that were similar to the explosions but were based upon what unit was firing the projectile and what it was impacting be it water, land, or in the air. The game uses a “strategic zoom” system that allows the player to zoom out far enough to view the entire map on the screen. At point it resembles the mini-map, denoting individual units with icons. At this zoom level most of what you hear is a space rumble with just a slight amount of processed wind along with the music track. When you zoom about half way back in you start to hear the ambient loops from the factories and energy generators and some wind. With the “Fog of War” tech that was implemented, any opposing faction that is under the fog did not make a sound. This helped to clean up the hundreds of sounds that were being triggered from the game engine. Only when a unit or group of units came out of the fog would you hear the sounds. To make all of this work and sound at least somewhat good, I assigned each sound a volume curve that was appropriate for the type of sound it was. I created separate volume curves that tied into where the camera was in relation to the ground. This was a complex system because the volume curves were also using variables that came from the front, the back and the side. If you were zoomed in close on a battlefield, the sounds from other units off in the distance had to be attenuated. This made it sound very realistic and cleaned up the soundscape. As you zoomed out the sounds right in front of you decreased in volume and the sounds from the edges of the map increased in volume, but at a certain point they had to be attenuated also because you were pulling back into open space and looking down on the planet surface. The camera sent all sorts of conflicting variables that each category curve had to sort out. These category curves had to be carefully adjusted to sound smooth and natural. There were many volume curves and each was assigned to a group of sounds. Explosions had a separate curve from factories and resource structures. 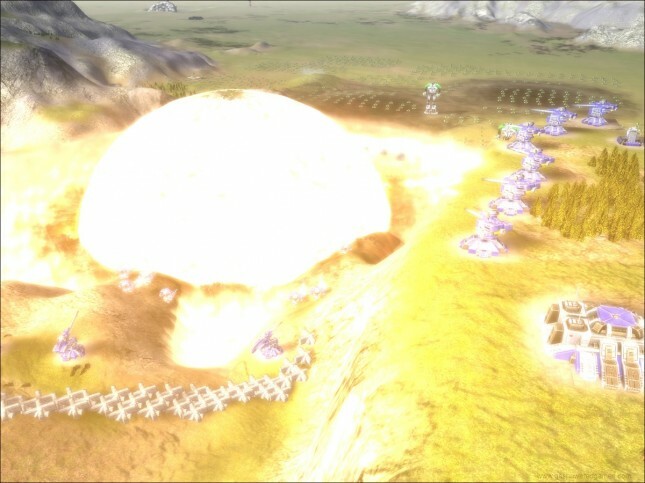 I wanted the explosions and impacts to have a slower fade out as you zoomed the camera out so they could be heard when the player was almost out to the “Theater of War” view which just showed the unit icons. All the other sounds faded out quicker with the factories and other structures that had a looping ambient sound fading out the fastest. This technique really cleaned up the overall soundscape because the loops were many and really built up if the player had a large base operating. If the player zoomed back in close up on the base, the looping sounds were at the volume appropriate for the zoom level and other bases or battles attenuated because they were off to the sides. To make up for the ambient loops fading to zero, I had a deep rumble and some light Sci-Fi wind fade in to make it sound like the base was operating in the distance. There were many other volume curves in play also and they all had carefully adjusted settings to ensure a clean and natural feel. In addition to the volume curves, there was a high frequency filter which kicked in during the zoom. The high frequencies were attenuated appropriately as the player zoomed out. The music and the UI sounds were at a constant level and were carefully adjusted so they worked well at different zoom levels. At times the game could get really loud especially on a huge multi-player map with three or more factions battling it out. Dialog was used during the campaigns and I wanted it to be heard clearly. To accomplish this, a ducking system was designed so everything but the dialog was attenuated when a voice clip played. This variable was a tough one to get right. To sound natural and not ruin the overall audio experience, it had to be set at a level that the player most likely would not notice. All they noticed was that they could hear the dialog even though there was an all out, balls to the wall, galactic battle going on. Time to Make the Sound Effects: How Big Is THAT Unit? I remember the first time I saw SupCom in action. I was blown away by the detail of the units, large or small. That detail allowed me to really understand the size and scope of the units. The smaller units were around the size of a car and the larger units were the size of an office building. The Armored Command Unit (or ACU) for each faction was very big and towered well above the large, medium and small units. Then there were the experimental units…they were absolutely massive. To get a grasp on the size and scale and how they were in relation to each other I used the ACU unit as the baseline. This unit needed to sound big, but not too big, because there were large artillery guns, huge Naval ships and the experimental units had to sound massive. The small and medium land, air, and sea units had what I call a normal, reality-based size sound. A tank sound similar to a tank in our world and a machine gun sound was similar to a modern day gun. Each faction had their own stylistic qualities, but the size ratios had to be consistent. The larger units were beefed up with rumbles, booms, and heavier sounds. The Experimentals were very challenging to design. They were so big that at times it was tricky finding the right process or audio asset to use to create the illusion of its size. I tried many different things but always came back to using pitched down sounds, equalization, and a little reverb to help create the “This is really big! Run like hell!” aspect of the Experimental. I would love to cover every unit category and all the different aspects of the category in this article but there is not enough space in the universe to completely describe everything. I will now cover some of the sound sources, the three factions design process, and a few of my favorite sounds created for a some of the units in the game. Sound Design: This Should Work, Right? The source material for this game came from man sources. The time and budget allotted did not allow me to record everything I needed for the game. I used CD library material, certain high quality online libraries, and my own custom sound effects that I had been recording over the last 15 years. I was fortunate enough to have a substantial collection of my own sounds available for many of the units. Airplane factory scenarios I covered with recordings I made at the Boeing 737 plant in Renton, Washington. Almost all the VTOL aircraft were created with my own military fighter jet recordings. I also had my own radio transmission sounds that I processed for the in-game cut scenes, and I used a fair amount of the thousands of metal impacts from my archive. A game of this magnitude, in terms of gameplay, assets, and overall design, usually requires a team of sound designers and management. I was working completely alone when I began researching the new sound engine and designing the sound effects. Yep, just little ol’ me with a mountain of work ahead of me. I was okay for a while and then the art and effects department caught up with me and unleashed a massive amount of units that needed sound and implementation. Sounds as if I needed some help, right? I was able to find someone to join me. I enlisted Howard Mostrom to come on board, and we worked side-by-side until the end of the development cycle. I was able to take a more relaxed approach to designing the sounds and had more time to oversee the schedule and all those other Audio Director duties: screening music, attending high level meetings, and driving the whole process to the end. Thanks to Howard, who was amazing, I was able to do that and not a have a heart attack. There’s the United Earth Federation, regular humans armed with futuristic versions of modern-day weapons and vehicles, such as tanks, naval ships, and aircraft called VTOLs. The UEF had a conventional modern day warfare type of sound to them along with some synthesized Sci-Fi elements added to make them sound 37th Century. I used all kinds of sounds from WWII artillery to current machine guns. Once I added a certain Sci-Fi sound or slight delay based process like chorus and granular synthesis, they took on a ultra futuristic character while retaining their “human” element. It’s kind of funny because the vehicles and anything with an engine had a smoke pipe for fossil fuel exhaust and it was the Earth’s 37th Century army! I thought this was cool because I could use engines from trucks, tanks, and cars for the source and it sounded appropriate. The Cybran are humans with microchips implanted in their heads. The Cybran use mech-style robotic units, ranging from two-legged walking tanks to the gigantic mechanical spider with massive laser powered weapons. To make these stand out from the UEF, I used a lot of flanging and comb filtering effects from the Eventide Anthology II plug-in bundle. I was really happy with the results I got from some of the retro flangers they have in the collection. I created a few strange cyber-robotic flange presets that I would try on a particular group of sounds. The land vehicles, the Naval ships, and the aircraft all had there own preset and I would tweak them when needed depending on the source. I would say I had the most sound design fun with the Cybran. I could go way over the top to mangle some of the elements in the sounds and it would not be overbearing and stand out in the game. I also used variations of these Eventide presets for the dialog which tied the whole faction together. The Aeon are humans who have adopted alien technology and believe that they have to cleanse the world of the warmongering UEF and Cybran factions. I came to the conclusion the Aeon were special and evil at the same time. Their overall sound came from processing synthesized drones and tones with Waves Transform bundle. I used mid range synthesizer filter sweeps and high pitched resonant laser sounds along with some organic based elements to give them the overall “calming evil” character I thought would work. Certain Waves Transform plug-ins were used daisy chained together with lots of doubling, chorusing, and phase effects. Some of the sounds also had a wobbly effect on them like a strange pulse that fit right in a sonic hole left open by the other factions. I was very pleased with the results and the player will definitely know that a Aeon unit is unleashing its evil path of destruction. Wrap It Up with A Bow and Ship It! The game cut scenes and cinematics were all completed shortly before release candidate builds were started. In the end I felt good about the sound of the game as a whole and and could not have crossed the finish line without the incredible help and ideas from Howard Mostom and Executive Producer Gary Wagner. I wish we could have had a more stable sound engine, but at the time and with the assistance of the XACT team at Microsoft, it is what it is…a massive audio experience that allows the player to fully experience the game in all its glory, and it will hold up through time. The music score for Supreme Commander was composed by Jeremy Soule. All images and sounds copyright 2007 Gas Powered Games. All other copyrights are held by their respective owners. This is stupidly awesome, great work man!!! !